Woody Allen famously said, "The heart wants what the heart wants," but what we often forget is that everything we attribute to the "heart" is actually a product of the brain—its twisting neural pathways, its reserves of memory, its manufactured construction of the self. And the brain can easily be fooled or otherwise manipulated, by ourselves and others, by drugs or deep states of altered consciousness. That's the overarching theme of Trance, the latest film from Danny Boyle, the high-energy stylist of Trainspotting, 127 Hours and Slumdog Millionaire. The film begins, at least, in the familiar art-heist territory of Entrapment and The Thomas Crown Affair. X-Men: First Class' James McAvoy plays Simon Newton, an auctioneer for "Delancey's" which is about to commence bidding wars on the Goya painting Witches in the Air. Simon's opening voiceover narration gives a run-down of how increasingly sophisticated art thieves must be to keep pace with evolving security technologies, but heist-master Franck (Vincent Cassel) and his thugs get by mostly on brute force when they burst in, tear-gassing the room and leveling shotguns at the security guards who've been taught that "no piece of art is worth a human life." Simon, as it turns out, is actually an inside man, tasking with hiding the painting—a hefty gambling debt has driven him to assist in the theft—so it's initially confusing when he zaps Franck's neck with a taser, prompting the comically unfazed criminal mastermind to bludgeon him in the head. When Simon wakes up later from a brain surgery and a medically induced coma—perceived as a hero for trying to stop the thieves—he goes home to find that Franck and his goons have completely trashed his apartment looking for the $26 million painting. He would gladly tell them where it is to avoid the fingernail-pulling tortures they inflict on him, but there's one problem; he simply can't remember. He's got a specific sort of amnesia—or does he, you might ask—and Franck isn't about to accept "oops, I forgot" as an answer. Enter hypnotherapist Elizabeth Lamb (Rosario Dawson), who is hired under false pretenses—Simon tells her he needs help finding his "keys"—but who quickly susses out the real dilemma. What's more, she unexpectedly ingratiates herself with the band of thieves, sleeping with Franck and using sexual jealousy as a central aspect of Simon's ongoing memory treatment. Is she just looking to spice up her dull clinician's life? Is she in it for the money? Or is there some deeper motivation? To reveal anything more about the specifics of the plot would be criminal, but suffice it to say that Trance has a looping, time-skipping, smashed-to-shards story that can only be pieced together in hindsight. Even then, there's some ambiguity`about the order and was-or-wasn't-it-real nature of certain events. It all seens to fit together, but this is one of those movies where a second—or third— viewing is almost mandatory. The question, then, is whether or not Trance is worth a second or third viewing. The condition for that would being that you really do have to enjoy these kinds of chronology-adverse thrillers and the complications that inevitably come with them—the general narrative confusion and the difficulty of connecting with characters whose motivations are so well- concealed that it takes some significant end-of-the-film exposition to properly reveal them. Some of Trance's turns are ludicrous, and the movie's intense, candy-colored cinematography, speaks to a certain amount of neo-noir style over substance. It's gorgeous, but considering the subject matter, there's unfortunately not much here to latch onto in terms of real ideas about identity and consciousness, free will and memory. The best way to describe Trance is that it's basically Eternal Sunshine of the Spotless Mind, if Eternal Sunshine were a crime thriller with little emotional or mental engagement. Trance may be a flight of creative fancy for Boyle, but the commanding presence of its leads does help keep it grounded. Though McAvoy's character is the least believable—he's perhaps a bit too confident for a man in his position—the actor brings a dimensionality to the indebted auctioneer, effectively fuzzing the good guy/bad guy distinction. Likewise, Vincent Cassel might be somewhat typecast as a criminal genius, but hey, he's great at playing these sorts of slippery, eel-like parts. What's most surprising about the film is how Elizabeth slowly emerges as the main character, playing these two men off of one another. Rosario Dawson is perfect—steely and vulnerable, sultry and ice-cold. If the film were made in the late '80s, you could imagine Sharon Stone in the role, but maybe that's only because Dawson totally one-ups Stone's famous Basic Instinct leg-crossing scene. 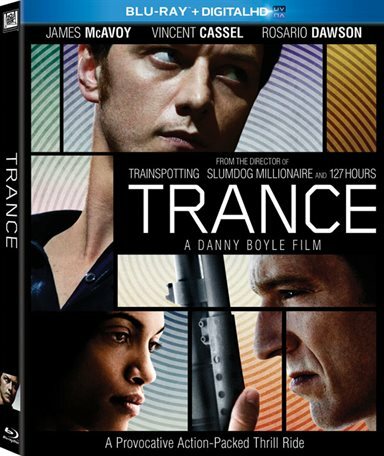 Coming from Danny Boyle, it's no surprise that Trance looks spectacular, alternately creamy and candy-colored, with visual peculiarities meant to heighten the disjointed mood. Overall the image in Fox's 1080p/AVC-encoded presentation is very impressive. On the whole, the image is sharp and detailed. Color is excellently reproduced too, vivid and dream-like, with balanced contrast. Trance aims to put you in one, with a lossless DTS-HD Master Audio 7.1 surround track that's enveloping and forceful, with great sound design and a pulsing, hypnotic score. Underworld's Rick Smith, a longtime Boyle collaborator, provides the film's music—which melds electronic and orchestral instrumentation—and it sounds fantastic, with clarity through the range, dynamic presence, and a weighty low-end that surges beneath the tensest scenes. Deleted Scenes: There are seven deleted scenes here, mostly extended parts of pre-existing sequences. The Power of Suggestion - Making Trance: An excellent four-part making-of documentary covering the film noir aspect of the movie, the hypnotherapy premise, the distinct visual look, and the final "rewrite" of the script—the editing process. Danny Boyle Retrospective: Boyle looks back on his career thus far, commenting on the motivations and approaches behind his films. Short Film: "Eugene" by Spencer Susser: This has nothing whatsoever to do with Trance, so I'm somewhat confused about its presence here, but "Eugene" is a short film by Hesher director Spencer Susser, about a traveling schlub who checks into a Washington D.C. hotel and finds a laptop that has the power to grant all his wishes, to disastrous result. A new take on the old genie-in-a-bottle trope. If Boyle tested audiences' capacity for pain with his nerve-splitting 127 Hours, in Trance, he's out to fry our brains, making us question everything we think we know about the film's characters and their motivations. Some folks will be into this—and the film definitely has its pleasures— while others might find it a style-over-substance Möbius strip, so circular and insular that it's hard to properly enjoy. Personally, I found it fun but un- engaging on any level besides the superficial thrills and gorgeous cinematography. 20th Century Fox's Blu-ray release looks and sounds great, though, and comes with some fine special features, so if you're a longtime Danny Boyle fan—and you enjoy twisting, looping stories—it's ultimately a worthwhile purchase. Download Trance from the iTunes Store in Digial HD. For more information about Trance visit the FlickDirect Movie Database.